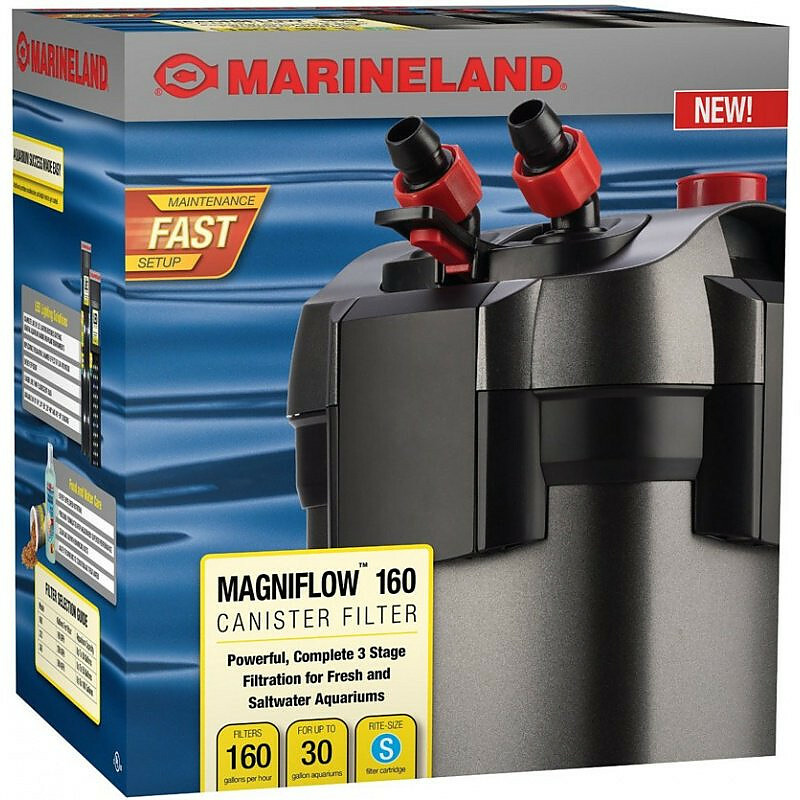 The Marineland Magniflow Canister Filter provides powerful filtration to keep aquarium water clean, clear and sparkling. Its efficient 3-stage filtration system removes biological waste, discoloration, impurities, dirt, and debris from freshwater and marine aquariums. The Magniflow is loaded with user-friendly features to make maintaining your aquarium easier than ever. The canister lid creates a water-tight seal when pressed down, and lifts up for easy removal. Stack n' Flow filter trays allow multiple media layers for total filtration, and are easy to remove for media cleaning or refreshing. 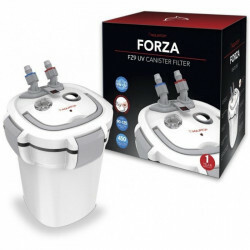 A quick-prime button fills the filter chamber with water for fast, self-priming setup, and a valve block lets you immediately shut down water flow and separate the lid from the motor housing for simple, spill-free maintenance. Carbon Filtration: Inside the carbon bag, Black Diamond Premium Activated Carbon removes odors, discoloration and water impurities. Replace carbon bag monthly since carbon de-activates with use. Biological Filtration: Bio-filter balls and rings provide large, multi-faceted surface area for Bio-Spira® and beneficial ammonia-reducing bacteria colonies to thrive. Magniflow 160: Rite Size S filter cartridge. Magniflow 220: Rite Size S filter cartridge. Magniflow 360: Rite Size T filter cartridge. Note: Formerly the Marineland C-Series Canister Filter. Magniflow filters are still compatible with Marineland Rite-Size Filter Cartridges. Model 530 is still available as the Marineland C-Series C-530. I'm using the Magniflow 160 in my 20 long. It runs quietly and was easy to set up and use. I like the built in flow diffuser on the outlet side - my betta sorority will appreciate a softer flow.They only change I made was to toss the carbon bags that came with the filter and replace them with ceramic rings. With a planted tank I prefer more biofiltration instead of the carbon which might remove nutrients that my live plants need. Great filter and is still doing great after almost a year! Very quiet and worth the money and the bio-filtration is great! My fish are doing great! This is better than any other filter I have ever purchased. I am impressed with the Marineland Magniflow 360 Canister Filter that I purchased for my 75 gallon aquarium. It is definitely quieter than a hang on filter and much less maintenance involved. I do water changes every two weeks and filter maintenance once a month. Great product and great price. I recently purchased the C360 series for my 75 gal gold fish aquarium. It has worked perfectly! Cleans thoroughly and keeps my water crystal clear! Love it! Great filter easy to start up a little noisy but works great. This Marineland C-360 Multistage Canister filtration system is one of the best. It has a great deal of power, is easy to set up, is easy to clean as long as you turn off the key, and the force of the water back into the aquarium is so strong that our fish love it. Our last canister filter lasted over 7 years before we needed a new one. Great for a turtle tank!! The turtle's water is crystal clear and odor free after 5 days of use. This definitely blows our previous filter out of the water (pun intended). The turtle is happy and we are happy. Great canister filter, my turtle water has never looked this clean, my turtles and I are loving it!! My husband set it up, had to prime quite a few times, then it worked great. This is my first canister filter having only used HOB filters before, so I can't compare it with other canisters, but against HOBs there is no comparison. The C220 was easy to assemble and get going and it runs so quietly the only way I know it's on is to check for waterflow in the aquarium. And the water in my 40B is crystal clear. I've only had it going for a few weeks so I can't talk to it's reliability over the long haul, but I am very happy with it at the moment. I just got the Marineland C-160 Canister Filter today and set it up on turtle tank and it keeps the water crystal clear. I'm going to try a different set of media next month to see how that affects the tank. It's better than the overhang filter I had on the tank. When it comes to having 2 Red Eared Sliders you know you need something that can do twice the work to keep the tank clean. I recommend it to any aquatic turtle owners out there. This thing is a beast! It's the size of a 5 gallon pale for comparison. I had purchase the C-220 at my LPS that wasn't holding up to my 9 fancy goldfishes in a 55g tank. So I ordered one of these not knowing the actual size of this thing. I've had this unit up and running since March 2012 and this filter, filters! I've replaced the stock media with Seachem Purigen and Matrix since and wow! This unit along with those products have kept this tank crystal clear and almost maintenance free. I've never experienced any leaks and the accessories that came with are heavy duty. The motor does give you an audible hum, but I have an open stand and its only noticeable when the room is completely quiet. Overall great filter. Nice C-160 filter with 3-trays. Shipped before 12pm and arrived at my door the next day via FedEx w/signature required which is good. Whoever packed my stuff I would like to say Thank YOU. I'm very impressed with the packaging, everything are carefully wrapped and lots of bubble bags to ensure safety. Also Liquid bottles are packed/wrapped nicely to avoid spills. Great customers service. This is the place to shop! Will definitely shop here again. This filter is amazing! I got the C-220 and it runs like a charm, no problems as of yet and it has 4 stage filtration for my model which is excellent! My water has never been cleaner! DOESN'T GET ANY BETTER THAN THIS!!!! I use this filter for 6 large aquatic turtles that are very messy to say the least. My water is so clear and my turtles are thriving and growing in the clean water. The 530C series is worth the money even if it is heavy. Works like a charm, quiet, easy to clean and has a nice look to it. Very simple to use. I purchased the 220 for my 55 gal tank. It keeps the water clear but I have developed an oil film on top of the waterline. I was told I am not moving enough water to break it up. I just purchased the 530 just to be safe. I am going to use both filters to do the job. Its probably overkill but too much is better then not enough. Basically, I recommend using the next size up from the 220 or bigger for 55 gallons. Keeps tank super clear and is super quiet. Unbelievable how quiet the C-360 model is. I have been having dirty water issues with previous filters and finally gave in and bought the 360. So glad I did. As far as pricing goes for filters and media, Pet Mountain has best prices of all retailers - trust me, I've checked them all. I inherited two red ear slider turtles from my grand son. We could not keep the water clean for more than three days. I bought the 160 model because of our 29 gallon tank. Its been 9 days and counting with clear water and no smell. What a relief! Would give this filter an A-plus. Very easy to set up and has a cd with it also. I have 2 c-220's on a 55gal with 260 assorted tetras in it. All water tests are great,no problems. Water crystal clear. Super easy to use and service. I am going to buy a c-360 that is going on a 40gal to be set up for discus and angels. This will be the fourth tank in the house and all use Marineland filters. For the price there just isn't any thing better! This product works really good and is very quiet. I have the 100 gal p/m filter. The filter has been running well for over a year. My son has 2 of these and has not had any problems for over 2 years. C-360 2+ yrs old, worked great until last cleaning. I have reassembled 4 times cleaning O-ring groove, and added Vaseline to O-ring. It is now sitting in a 3 gallon wash-pan and dripping away as I TRY to dry carpet. I Highly Recommend This Canister Filter! I purchased the C-360 for my Red Ear Slider. He is in a 46 bowfront. His tank has never been so clean! I Recommend this canister to anyone who has a fish tank. I have others in the past, but this tops the bunch! I am so gald I found this site!!! This is without a doubt the best canister filter you can purchase. I have C360 on a 75gal fresh-water tank with 10 small Koi. The water stays crystal clear. Easy to assemble, easy to clean. It's so quiet that you don't even realize it's on. My air pump is louder. It doesn't get any better. This filter definately does the job. My 55 gallon African Cichlid tank has never been this clear and clean. This filter replaced 2 Penguin 200 bio-wheel hob filters that never got the tank this clean. It's literally dead quiet and worth every penny. This filter is excellent.. also excellent price through pet mntn. I have 2 of them along with external filters on my 150 gal. and have great success.. thanks alot!! We purchased a C-160 for supplementary filtration in our 24 gallon saltwater tank. Even without the optional "polishing filter pads" this cannister quickly clears up suspended debris, especially after cleaning the sand bottom. Built-in priming pump, quick-connect hose assembly and layered media trays make it so much easier to setup and maintain. Note that the C-160 only has THREE trays, so if you need four, go up one model! Also, the C-160 does not include ceramic rings (for biological filtration), although for our supplementary purpose this was not a problem, sized correctly this would make a great solo pump/filter unit for any aquarium. I'm told getting replacement parts is easy, but haven't had to do so yet. Easy to setup and maintain. Measure and cut hosing before stating filter, its a mess if you want to resise it later. Also buy and extra polishing filter pad. After first cylcing it get dirty. I got the C360 for a 25 gal tank because the old filter would not keep the water clear. The water is now crystal clear with the C360 in service. Considering getting another unit for a total of two for a higher fish load. I bought this to upgrade the filtration on my reef tank and it is very easy to use and set up for a first time canister user. It is powerful and silent, the instructions are very clear. I love changing to it from the bio wheel. It is easy to take apart and clean, love the flexibility of different media trays. If you are thinking of a canister filter I would recommend this one to anyone. Marineland C360 is best canister filter for the price and function and comparable to Ehiem without the price tag. Very simple to use straight forward operation, the media basket nest tightly in the canister with very little to no bypass, prime button much better than Fluval, solid feeling not a stick with a suction cup on the end. Could use a drain valve on bottom of the canister to allow draining the canister to make it lighter and reduce a little splash of water when separating the valve block. In addition, a better method of securing the inlet and return assembly. The suction cup and weak plastic clip but tough to hold a hefty 3/4" hose with intake and return fittings. Very easy to clean with the basket system and motor and pump assembly very simple concept, may be a little tough to clean the ports need to use pet mountain's very flexible brush to clean the ports and water channel. 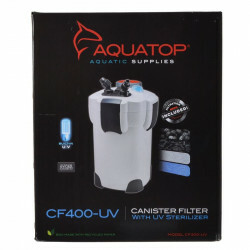 Overall I highly recommend this canister over the fluval for function and quality and over ehiem for the price. NEW Marineland C-200 is Excellent! This is probably the best filter canister available. I got my C-360 about a week ago. First thing that I loved about it is its easy assembly and the fact that it is friendly to clean, i.e. easy to dismantle and put back together. I also love the PRIME button and the fact that it truly does what it says, the media doesn't slow down the flow, fully packed still pumps at 360 gph. There is enough space in the trays to place your favorite media (I put phosphate remover between the carbon and ceramic rings). Works great. Worth the money invested. Your fish will thank you. Just got my Marineland C-360 canister. 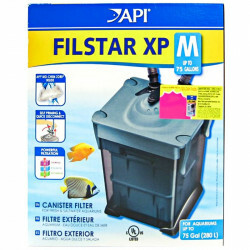 This filter does a great job, it went together easily, pumps a lot of water, and cleans well. The quality seems great, parts are sturdy, and it is very very quiet. It isn't silent, but makes no more noise than a small to medium powerhead. Overall I am very satisfied and am buying two more.